We often tell our family and friends about the weather, especially when it’s cold. What might you say if your loved ones were heading out into the snow today? What about if they were heading out into the snow for several days? If they were outside, fully exposed to the elements, what would they need? A tent? A sleeping bag? Thermals? A good coat and waterproof boots? Yesterday we encountered a group of teenage refugees in Calais wearing flip-flops instead of shoes. This week we have seen refugees with no tents, and no sleeping bags. Out in the open. 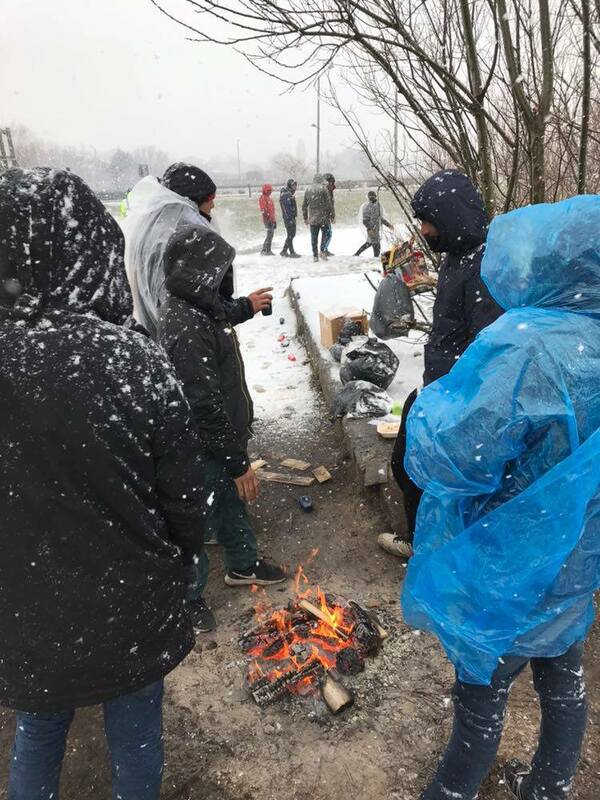 It is now snowing in Calais, tonight it will be -5 degrees celsius – with a bitterly cold wind blowing from the East. Over 500 refugees sleep rough in and around Calais and every day we try to keep them and hundreds more across Northern France and Belgium warm. We have a fantastic team of volunteers out this weekend in all weathers working hard to prevent loss of life. Please support our efforts and encourage your friends and family to do the same and help us reach as many people as possible.